This is a graphic novel-picture book hybrid that tells the story of a little boy growing up in Prague, behind the Iron Curtain. His schoolmates did forced labor in the fields. Art was censored. It only took very little provocation to be questioned by the authorities. He describes it as a difficult life, full of fear and empty of diversity. 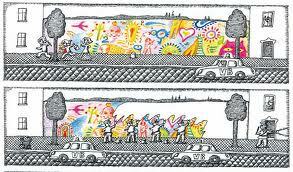 There was no television when he was young, so he drew his own pictures. He found refuge in painting the free and beautiful world he wanted, as well as in music. The format is interesting: there are diary entries interspersed with descriptions of historical events and drawings of his life. I loved the black and white drawings, with only red accents: it’s a very striking visual representation of the sameness and culturally bare life he describes under communism. When pop music begins to trickle in, the colors get more and more varied and vivid-a beautiful touch. I loved the story; it was interesting and not something you read about very often. This is a quick, informative text with a lot of creative art. Happy Reading! Sis, Peter. 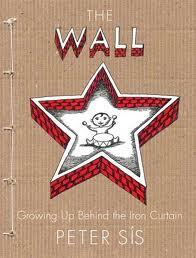 The Wall: Growing Up Behind the Iron Curtain. New York: Frances Foster Books, 2007. Ages 13 and up. Posted on May 1, 2011 by ShannaPosted in ALA/YALSA Best Fiction for Young Adults, Autobiography, Caldecott Honor Book, Graphic Novel, NonfictionTagged Beatles, coming of age, communism, Elvis Presley, Iron Curtain, Prague.